Gray is here to stay! 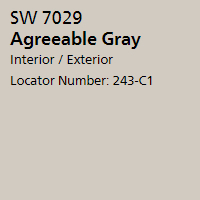 Gray has become a wildly popular color for both interior and exterior paint. It pairs perfectly with a wide variety of decor and can set the tone of a room anywhere from mysterious to glamorous to serene. Gray has become to the go-to color for home updates - simply changing your walls to a great shade of gray can bring new life to an older property. In fact, you could say it's a definitive neutral, an ideal option for maintaining versatility and polish. Gray can be light and dark, warm and cool, deep and rich, or pale and tranquil. Picking the right shade of gray will help you create the perfect ambiance for your home. When you decide to update your paint scheme it will be important to test the shade(s) you have selected. Check your gray color in all varieties of light - daytime vs. nighttime, fluorescent vs. incandescent, etc. And work with hues and tones. Paint an accent wall in a deeper shade of gray to create interest and depth in your room. Add a light gray to your ceiling to create a polished look. Use sites like www.pinterest.com and www.houzz.com to get ideas of gray color palettes for your painting project. And gray isn’t just for walls.. painting older cabinets a contemporary gray and adding new hardware can be a cost-effective way to update your kitchen. Here are some fabulous options to use when you decide to jump into the world of gray. Click on each color swatch to get more information about the hue and see coordinating and complimentary colors.